(I have no idea why this is on my mind). All kinds of things make me faint but nothing will knock me to the ground quicker than hearing a gory play-by-play of someone's surgery or other medical procedure. For some peculiar reason, the recuperating crowd gravitates towards me. Maybe I have “tell me something disgusting” written on my back and I just haven’t seen it. Fainting isn’t glamorous like in films. No swoon with makeup in place and a fluttering of the eyelashes as one “comes to”. No. It’s more of a sweaty vomit inducing experience that leaves the fainter looking like they’ve just gone through surgery themselves. There must be psychological studies on why people like to share this sort of information. (Oh, even worse, "let me show you my scars"). I'm not talking about war heroes here, I'm talking about your neighbour who just had his appendix out and is keen to tell everyone on the street. Looking at the different medical sites, they list a zillion reasons for fainting. Physical problems, illness. They don't spend too much time on the people that faint just because they're so grossed out they'd rather lose consciousness than listen to any more. There are little pictures of women from long ago swooning with the smelling salts near at hand. I have to wonder why they're fainting. Stories of leeching? Probably. Oh…..I lied about the fun and profit part. Sorry. 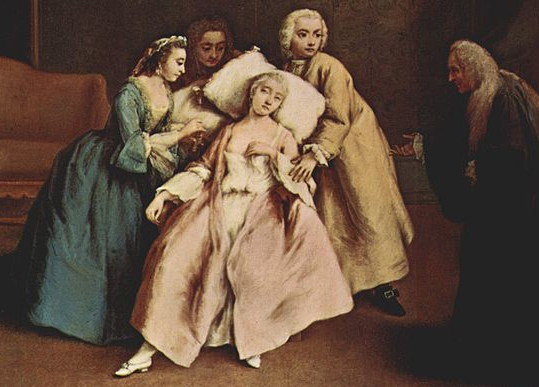 Sara commented: all those images of women fainting come from the era of corsets. it was common for women to pass out from lack of oxygen and the routine of carrying smelling salts at all times began. the best part about all of this was that it became fashionable... as the alternative was to go without a corset. god FORBID! Sara - if you're reading this - sorry, I lost your original comment. I was fooling around with a new comment system (which didn't work)! Going without a corset! That would be awful! LOL! i can't imagine how one could be without a corset. i mean, all the restriction of breathing is such a small price to pay for such an excellent bust!